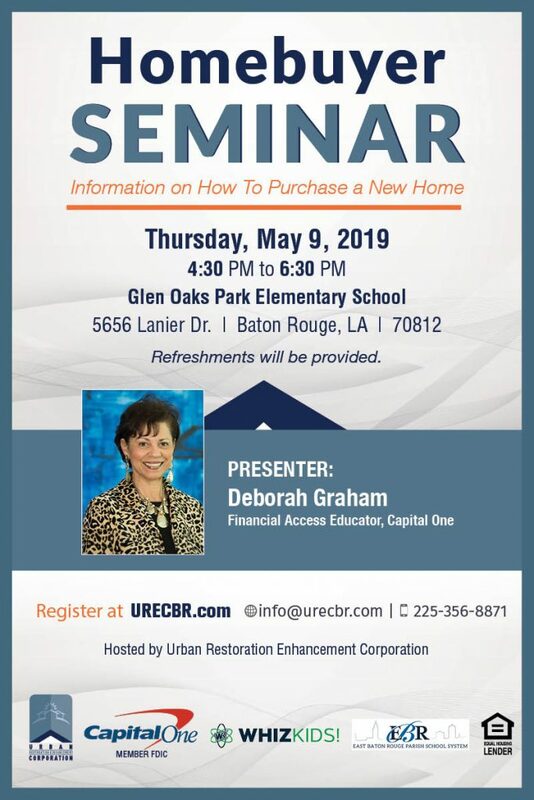 Urban Restoration Enhancement Corporation (UREC), in partnership with Capital One, Glen Oaks Park Elementary School (GOPES) and UREC’s WhizKids initiative, will host a Homebuyer Seminar on Thursday, May 9, 2019. The event is open to GOPES parents and residents from the Glen Oaks community. Deborah Graham, Financial Access Educator with Capital One, will facilitate the seminar and discuss steps towards homeownership. Registration is required and is open to the first 50 registrants. Registration will close on Monday, May 6th or once the registration cap of 50 is met. Childcare will be available only for Glen Oaks Park Elementary School students if needed. Students names must be listed in your registration. See below for details. Light refreshments will be available. Complete the online registration below or by clicking here.